Palak Pakoda / Spinach Fritters is a delicious & crispy Indian Snack made with fresh Palak / Spinach leaves, Gram flour and spices. There are many recipes to make Palak ke Pakode using different methods, but here I am sharing the recipe of Spinach Fritters made with whole spinach leaves instead of chopped palak. 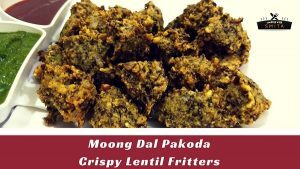 Try this irresistible deep-fried evening snack during monsoon. Wash & clean Spinach leaves dry completely using a kitchen towel and keep them aside. Take Besan in a bowl, add Rice Flour and all spices – Turmeric Powder, Red Chilli Powder, Carom Seeds & Salt. Add the little water at a time and prepare the medium-thick batter. Take 1 Spinach leave at a time, dip into the batter, coat well with the mixture from all the sides and fry till they turn slightly golden brown. Remove from oil and place on a paper napkin lined plate. 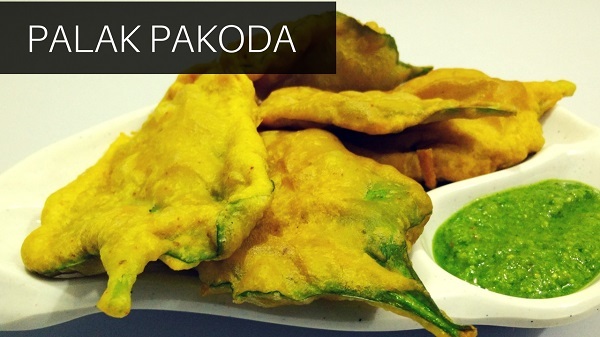 Serve hot Palak Pakoda with Green Chutney.